Every time I tried to enter a digit on the EASY I get the letter E blinks. Strange. Have a good one - rain or shine! Good morning Hal, Wow, Anne, & Shiela - mostly sunny here - hope it continues since we just washed off our back porch with rugs hung on our fence to dry; it would be nice if they dried today!! Welcome to the stragglers wo saunter in later. Everybody!! Ah, a few more today. Plum - check your inbox for that info you requested! Morning all, beautiful photo , Wendy. 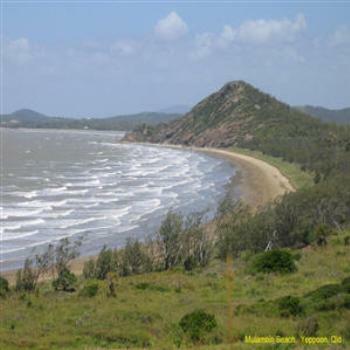 Yeppoon is one place I have been but only in winter, way too hot for me in summer. Well, it seems I can use baking soda, rubbing alcohol, honey, and my favorite....toothpaste. Relief is on the way! Well, a home remedy is a paste made of baking soda + small amount of water... leave on for 10 minutes. Looks like Kathy & I had similar thoughts... probably from our mothers! Belated birthday wishes to Cathy. I'm also waiting for Cathy's next book ! Wonder if Keith is lurking? Shiela beat me to it ! One way or another, looks like you and I both had Keith's number, Amelia!!! You need a good dose of Vegemite to keep those pesky varmints away, Kathy. Do you eat some, Peter? Or spread it all over your body? And we have it for breakfast with toast and tea. Thanks to Kathy, Peter and Hal. Depends on the company, Hal! Wombat and Peter: Thank you for your comments. But, as I had the opportunity to taste Vegemite when we were in Oz, I believe I'll pass. It was a bit salty and I'm afraid that if I spread it on my legs, I might attract more unsavory varmints. Another gorgeous Aussie Beach - thanks, Wendy! Forgot to comment on this straight forward 1-&GT;9 - zippy solving! Was off enjoying the Mr. Rodgers movie instead of waiting around for 22 ... then went out for pizza. Was fun. It has been raining for what seems like weeks, and rain is forecast for the rest of this week, but now it is more than raining. Water is pouring out of the sky without bothering to form raindrops. It's as if the clouds just have hoses to stream water down from the sky. It is LOUD! Too noisy to let me sleep, and it is 2 am, a time I might well like to be in bed. I really do wish we could share our excess water with California. Tonight's rain alone could put out the fires, not to mention that the fires could not spread as they have if the ground was as sopping wet as ours is. How d'ya like that? I just checked the map - The current area of rain slants northeast, so it is not raining where Kathy lives, about 20 miles due east of here. OMG I just heard that there are terrible wildfires in Canada, too. No surprise, an alert was just issued about flooding in the District of Columbia. Both rivers (Potomac and Anacostia) as well as smaller waterways. Other nearby rivers in Maryland, too. I will not be going anywhere today. Maybe I will be able to sleep if the rain quiets down.